I’m the founder of a UK registered charity called ugive2uganda. Our small charity delivers a variety of aid and support in the Mbale area in the east of Uganda but my main focus is the development of youth music. Since September 2007 I’ve been living in Uganda and have been working hard to create the beginning of a UK-style brass band movement (there are already many brass bands in Uganda who play by ear in a busking style but there are very few that can read music). When I started the program the children had no concept that music could be written down on paper. But they have quickly adapted. And you can imagine the challenges that we have faced in terms of instruments, transport, and rehearsal facilities. Many of the children in the bands have their own tales of hardship and struggle. But it’s a privilege for me to watch them develop as musicians and individuals through brass music, and I’m so proud of them as they battle through adversity to come and play with a smile on their face. As you may be aware, teaching a child a musical instrument is not just about the playing. It’s also an opportunity for a child to develop a sense of self-esteem, and the responsibilities that come with being part of a team. Here in Uganda, it’s particularly significant that we’re teaching children about discipline, concentration, teamwork and, most importantly, a feeling of belonging to something and that they matter to each other. This is real development for Africa youth. now managed to bring enough instruments to Uganda to create eight bands in the project and we now have more than 500 children learning to play across the program as a whole. 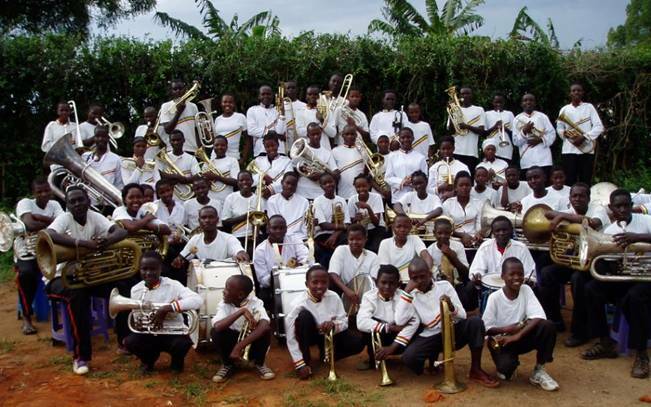 Our best band, Mbale Schools Band, can play 100 hymn tunes, dozens of standard marches, and many other concert pieces. Our best 25 players have reached youth band contest standard in the UK. More importantly, I am starting to see some sustainability in our project and the movement is growing. Brass bands in Uganda earn money from functions. This money is shared amongst the children so that they can buy their schoolbooks and for their other small needs. But the money also provides a living for the Leader of the band. Six of our bands are now earning a regular income from engagements and have become sustainable in their own right without me. I teach the band leaders, give them instruments, and then it’s up to them to make a living from music if they can. There is very little youth music in Uganda and this seems a tragedy to me when many children are so talented. All our kids can sing, dance and some can even do acrobatics! Very many children in Uganda face unemployment when they leave school. By encouraging youth music perhaps at least some of them may be able to earn a living as a musician or music teacher. In the context of giving aid to Africa it is much better to give someone a chance of a job than to give money from the UK. So as I nurture the children through sickness, hunger, opposition and poverty, we come to our rehearsals together as a team with one dream - to become the first African brass band in history to compete in a UK band contest. We can only do this if we can raise about £15,000 to cover air fares, etc. If this is unattainable then our second target is £5,000 for a complete set of proper uniforms (we have 100 children in just our main band and there are eight bands). I realise that the amount of money we’re aiming for is a daunting challenge. For those supporters who may want to help on a smaller scale, the children and I would be so grateful for even the tiniest amount of help. Alternatively, perhaps you could consider sponsoring a desperately needy child in one of the bands (we already have sponsors for twenty children). This costs £15 a month and details are available on our website. If you can help in any way please contact me by phone in Uganda on 00256 7731 46983, or by email at ugive2uganda1@aol.com. Or see our website at www.ugive2uganda.org, especially the 2014 Spring Newsletter. You can also see the band playing on youtube.com by searching for “Mbale Schools Band”.